The Dhola Sadia bridge on the Brahmaputra will cut travel time for commuters by four to five hours. Prime Minister Narendra Modi will dedicate to the nation Friday India’s longest bridge, located on the Brahmaputra river in Assam. The inauguration comes on the occasion of the government completing three years in office. 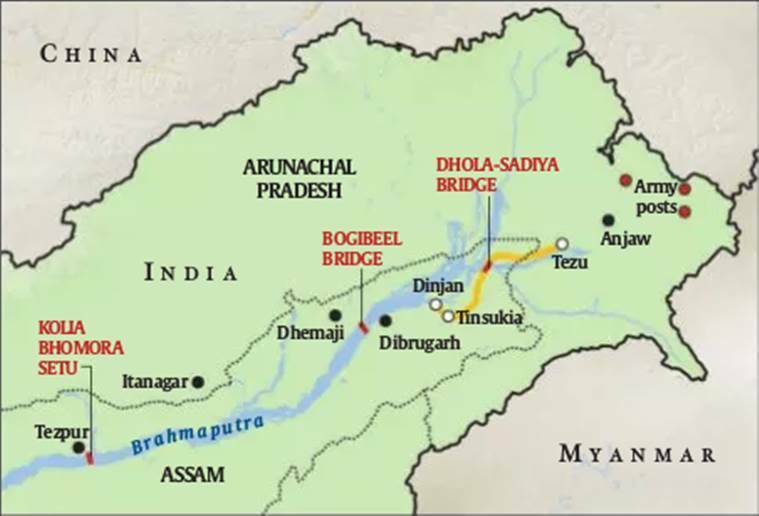 The historic bridge, which shall link Dhola to Sadiya in Tinsukia district of Assam is crucial from the strategic perspective as it is close to the border state of Arunachal Pradesh. 1. Owing to poor connectivity and transport issues, Sadiya has alaways been an isolated and disadvantaged town in Assam. It is a subdivision of Tinsukia district, bounded by rivers on three sides: Lohit, Brahmaputra and Dibang. The new bridge is expected to change the transportation scenario of the region. 2. At 9.15 km, the bridge is longer than the Bandra-Worli Sea Link (5.6 km) by nearly two-thirds. Sadiya is the birthplace of iconic singer Bhupen Hazarika. It was once a thriving town until an earthquake struck on August 15, 1950 and the mighty Brahmaputra changed its course, engulfing half the town within days. Since then, the place has been struggling with transportation woes. 3. The fourth bridge on the Brahmaputra, it will boost communication across eastern Arunachal Pradesh. The most significant beneficiary will be the Army, whose convoys will now save an estimated three to four hours in their journey from Assam to their posts at Kibithoo, Wallong and Chaglagam on the Arunachal-China border. Thus, the bridge is a great strategic boost to India’s defence capabilties in the North East. 4. Considering the geological vulnerabilities of the North East, being a high-seismic region, the bridge was built using state-of-the-art equipment, including imported hydraulic rigs, and provided seismic buffers in all its 182 piers. 5. The road transport and highways ministry cleared a feasibility study in August 2003 after demands from the locals. Construction began in 2011 and the original target date for completion was December 2015 but deadlines were breached and there were cost overruns. 6. The bridge shall enhance Indian Army’s mobilisation capabilities and movement of troops and heavy equipment in the forward areas bordering China. As of now, Army convoys in Assam either spend hours crossing the river by boat from Dhola to Sadiya, or take a circuitous 10-hour, 250 km road trip from Dinjan division HQ, near Tinsukia, to Tezu in Arunachal, before driving ahead to the border. 7. The bridge is said to withstand the weight of a 60-tonne battle tank. 8. The bridge is located 540 km away from Dispur, the capital of Assam, and 300 km away from Itanagar, the Arunachal capital. People from Arunachal travelling to the airport in Dibrugarh or the main railway station in Tinsukia can access the bridge to reach faster. 9. Presently, it takes eight to ten hours from the border district of Anjaw in Arunachal Pradesh to Tezu, followed by another eight hours to Tinsukia or five hours to Dibrugarh. The new bridge will cut this travel time by four to five hours. 10. In contrast to the architectural and transportational accomplishment that the bridge has achieved, there’s a human cost of displacement as well. The boatmen who used to deploy all their boats whenever an Army convoy arrived have lost a big share of their business. Around 150 boats used to ply between the two ends of the river and with the inauguration of the bridge, their livelihood is said to be in the doldrums.